P.S. Stop by tomorrow and I'll tell you how I made those margaritas!! 1. 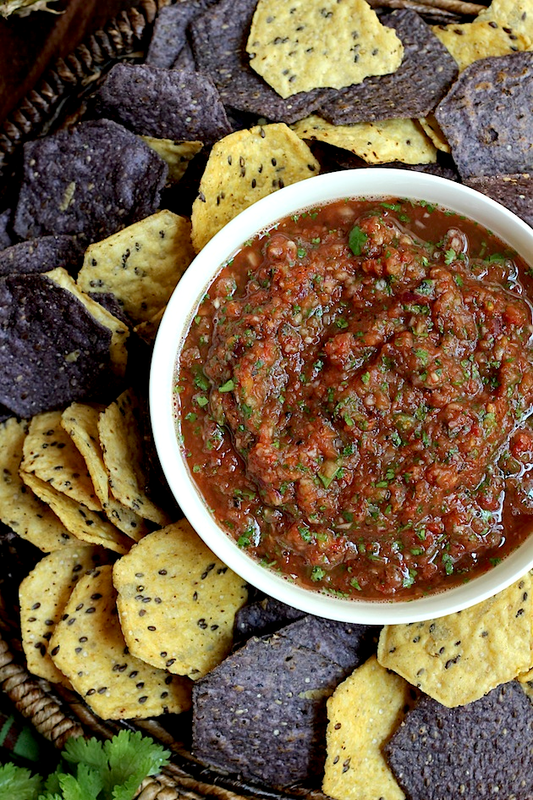 For a chunky salsa, pour the diced tomatoes into a fine mesh strainer to drain some of the liquid out while doing Step #2. 2. Add the onion and the garlic to a food processor. Pulse the processor a few times until they are finely chopped. 3. Once some of the liquid has drained out of the tomatoes, add the tomatoes, jalapeño, lime juice, lemon juice, cilantro, and salt and pepper (to taste) to the processor. 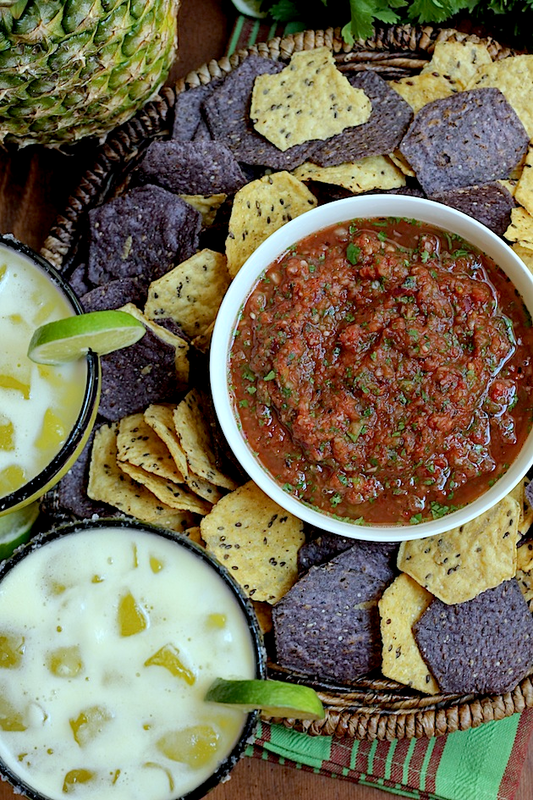 Process the ingredients until the salsa reaches your desired consistency. Adjust the seasonings if necessary. 4. Serve immediately or store in an air tight container overnight. It will taste even better the next day! Thanks so much for this recipe! I can't wait to try it. 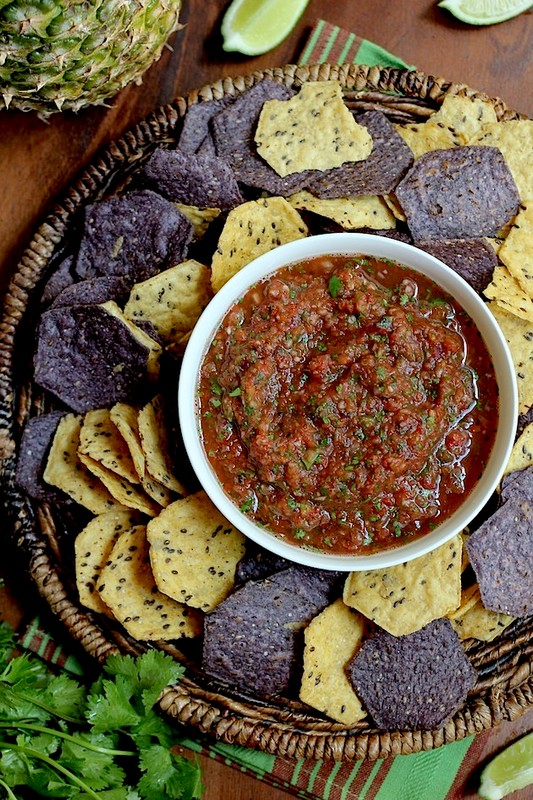 While I'm late for Cinco de Mayo, I have been thinking of a fire roasted tomato salsa I once had and wishing I could remember where I purchased it. However, I'm reeeeaaalllly trying to avoid processed foods these days so I am so happy to have this recipe. The big thing is I never knew you could buy canned fire roasted tomatoes. I realize they are somewhat processed, but I will look for ones with minimal additives. Thanks, again! Hi Maureen! I used Muir Glen's Organic Diced Fire Roasted Tomatoes. They don't really contain any processed ingredients and has great flavor! Let me know how you like it if you make it!